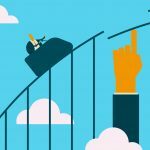 The Importance of a Long-term View - Kattan Ferretti Financial L.P. Investing is a world that plays with our emotions, as we watch our money fluctuate without much control over the end result. It can be very stressful, often leaving people wondering what to do, what changes need to be made, whether to buy or sell and how much. These decisions are too important to be made emotionally and far too often are these decisions made incorrectly because of our biases as human beings to put much more emphasis on short-term rather than long-term results. For institutional traders, they make a living on the short-term. Taking advantage of fractional price discrepancies, making dozens of trades per day, it’s how they make a living. We, on the other hand, live our lives outside of the stock market and don’t have the time to dedicate ourselves to full-time trading. That being said, it’s imperative that we take a step back and understand the purpose of our investment. We aren’t trading to make a quick buck, sell, and go buy a fancy dinner. We invest for our retirement, our children’s educations, a Southern retirement home, whatever it may be. These are all long-term goals and what needs to come with long-term goals is a long-term view of the market and our portfolio. We as humans see a negative and let it distort dozens of positive things around it. Not just in the market, but in everyday life. A student who has an A in the class but got a C in a recent assignment will dwell on the C instead of remembering the fact they have an A. A couple who has gone to the same restaurant a number of times with good experiences has one out of the ordinary, not-so-good meal and may never go there again. Professional golfers can be a tremendous example of long-term thinking and its link with success. They have a very strict routine, for everything they do. They often times find success but as every golfer knows, perfection is not attainable. Maybe they make three birdies in a row to get to -5 on the day and hook one out of bounds on the 17thhole. They can panic, change their routine because it’s broken and doesn’t work anymore, and search for a new one hoping to find success, or they can relax and realize they are still playing an amazing round and finish strong. They understand these things are going to happen and they stick to their process no matter how ugly it may get because in the long run they’re going to be successful. This relates perfectly to our perception of the market and our accounts. We dwell on one negative day and lead us to believe things need to change. It’s these short-term thoughts that slowly eat away at our accounts when in reality spending time in the market is the most efficient way to get returns, not timing the market. People who invested in late 2007 before the 2008 pullback may have lost half their money over those few months, however if they stayed invested until now, they not only made their money back, but doubled it. 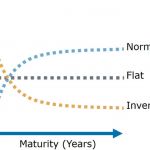 The market goes through phases, but has a long-term upward trend that rewards those that are patient. The mindset and understanding that your account is going to fluctuate is utterly important, especially during volatile times. It’s so easy to become scared and take your money out when things seem grey but that may only last a day, a week, or even a month. Overall, things are going to turn up, and use 2008 as an example that sometimes the best way to achieve success is to do nothing at all and let your retirement funds rise naturally. This chart perfectly demonstrates the emotions people go through in their investments, and it destroys their accounts. 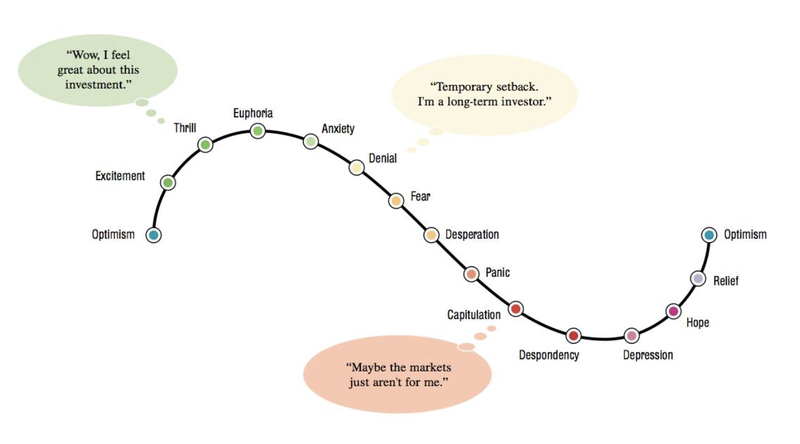 With a short-term view, you will buy high and sell low based on speculation and fear. Fighting these emotions and being patient will bring far more success.